If you’re thinking about investing in a Learning Management System (LMS), you’ll realize that the market has more than 100 options to offer. Skimming through each of these LMSs and selecting the right LMS can be cumbersome. Being an e-Learning and LMS service provider for almost 16 years, we understand the challenges of making an LMS that is easy to manage. The launch of “Effectus”, an LMS based on the open source LMS Moodle, has simplified the lives of administrators and users. Effectus is a 21st Century LMS, which is customizable, easy to use, and saves your time and effort to make learning management easier. Let’s see a few highlights of this LMS. 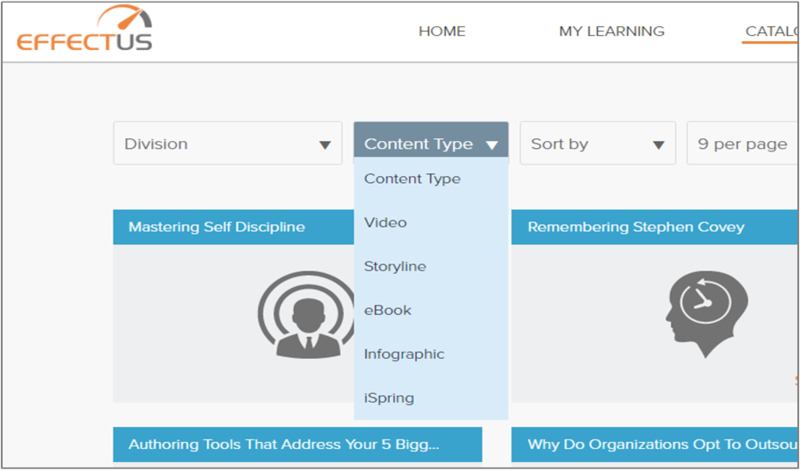 Effectus lets you create/check learning paths of individuals/groups of learners with ease. The LMS allows administrators to send automated email notifications, such as confirmations, reminders, alerts, etc.,. With this LMS, you can help learners access eLearning courses with the intuitive dashboard, view transcripts and register for classroom training. Let’s see how Effectus helps in managing your training effectively. Effectus can store classroom training resources sand online learning assets in a single, centralized and secured location. Using a simple upload form, administrators can upload SCORM courses, depending on the standards accepted by the LMS. Effectus accepts courses of SCORM 1.2 and SCORM 1.3 versions and AICC and Tin Can compliant courses. With Effectus, organizing webinars is a cakewalk for administrators. Learners can register and trainers conduct the webinars very easily. Learners can view, sign up and register for training through the LMS itself. The whole process of classroom training registrations can be integrated into the LMS. Learners can export and integrate the training calendar from Effectus into outlook or Google calendar, informing them of upcoming training events. You can completely automate the classroom training activities like registration, reminders, online attendance, waiting list, training calendar, etc.,. 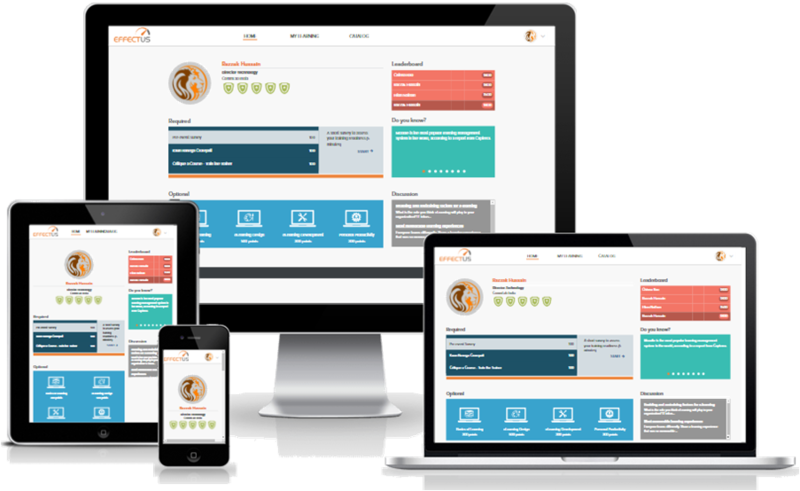 Effectus LMS has a highly intuitive dashboard, which allows learners to perform LMS activities with just a couple of clicks. The LMS has a clean and crisp UI with a clear ‘call to actions’. Effectus makes it easy for your learners to search for and find the best of your courses, for their needs. Without overwhelming the learners with too many features, the LMS does everything you’d want, all while looking awesome. Effectus allows you to assign points to every activity and watch your learners compete on leaderboards. You can add customizable badges on completion of learning paths and goals. You can have site badges, given when learners finish activities in the LMS. 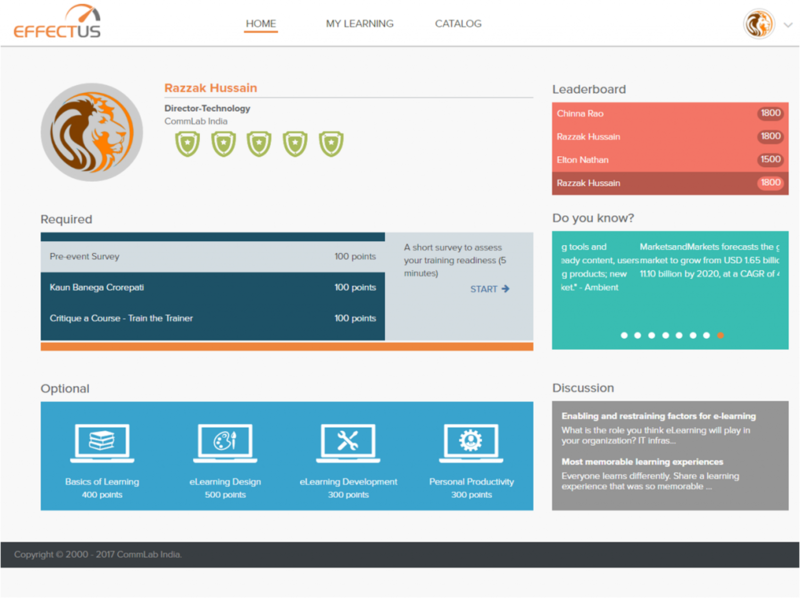 Also, you can have course badges, given when learners complete various activities within a course. 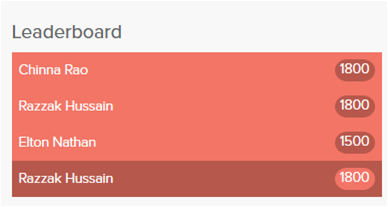 Also, there is a leaderboard that displays the users who have completed the most number of courses. Also, the LMS has various social media tools that foster a sense of community, to exchange ideas and knowledge among the learners. It has features like discussion boards, file sharing, virtual chats, blog, and wikis. Every organization will have different processes towards providing training to their employees, and their extended partners. Since commercial LMSs are designed for generic requirement, to customize these LMSs according to their training process will incur huge costs on the companies. Since Effectus LMS is based on open-source LMS Moodle, it is highly configurable and flexible. To top it all, there are hundreds of plugins available to configure the LMS just the way you want. Total duration spent on training. Course status values such as, Not started, InProgress, Completed, Incomplete, Passed and Failed. No of attempts by each learner to complete a course. The scores of each attempt are also tracked. The correct and incorrect response of the particular knowledge check. You can also get a graphical representation of all learner feedback for a particular course. 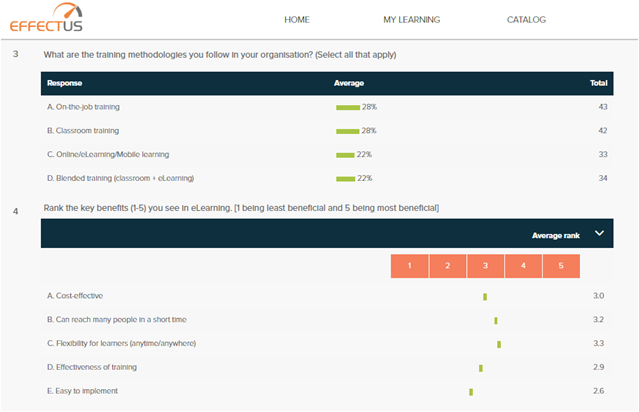 You can generate more than ten types of reports from this LMS, such as Grade Report, Participation Report, User-wise Course Completion Report, Course Access Time Log Report, Course Evaluation Report, Quiz/Assessment Report and much more. All the reports can be exported to Excel for further analysis or submitted as proof of completion, to regulatory authorities. The LMS server has a Global domain as a default feature. All users and courses you add to the LMS server are included automatically in this domain. Effectus LMS allows you to create new domains as desired. You can add domains, according to the regions, or business function, or for extended partners. Domains are especially useful for large corporations who wish to control access to the LMS server, based on customer type. Effectus LMS offers learners the flexibility to access learning material anytime, anywhere and on any device – offline and online. This LMS is responsive, which means the LMS can be seamlessly accessed on all the devices. The LMS effectively tracks the learner activities, irrespective of the device the course is accessed from. Also, the LMS is also available as a Mobile App, to access the training with offline access. Mobile users can access Moodle in 3 ways- a native app, available on Google Play, Apple Market, and Windows App Stores. The LMS has 3 Premium options available – Basic, Business, and Enterprise. The pricing is based on available storage space, maximum users allowed and reports available. The LMS is priced in a way that organizations can select the LMS based on their size and the training requirement. The LMS comes with a committed 24×7 support team. Initial training is provided on the LMS administration. Later the support administration is provided at a nominal fee. The LMS can be deployed on a cloud server or can be deployed locally on your organization’s server. The LMS can also be integrated with third party applications and software, like talent management software, HRIS system, workforce management systems, etc.,. The LMS works on almost all the operating systems(Win 7, Mac OSX 10.7+) and is compatible to SCORM/AICC, and Tin-Can-API / xAPI. These are just a few sample features available in the LMS; the LMS is developed based on our interactions with our customers. Write to us to view the demo of Effectus.